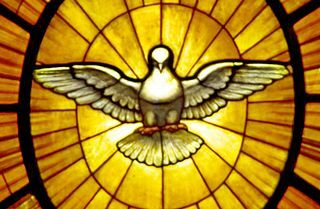 We’re on for a Sung Mass for Pentecost at Mulgoa this Sunday! Introit, Sequence and Communion as written. See Rene Goupil, scroll down for Pentecost. I’d love to sing the sequence in two choirs. The tune is echoed every second verse. It’s called the Golden Sequence: “It is commonly regarded as one of the greatest masterpieces of sacred Latin poetry ever written.” from Michael Martin’s Treasury of Prayers. Alleluia psalm toned as in the Liber Brevior and I’m not sure what to do with the Offertory - I guess practising it might be a good start. Veni Creator sung straight chant thing out of the Mass Books after Mass. Also, first blessings from our new FSSP priest Fr Leung! The Liber Brevior is a very handy thing to have if you can get one. It has all the music I’ve mentioned here and covers all Sundays through the year. You can download a pdf version from Musica Sacra’s Latin Settings Page (scroll down for Liber Brevior 1954).